The lull before the storm, or is everything turning out well? After an exciting October with lots of political drama, especially in the US, major equity and bond markets are steadily rising. Many investors may ask themselves why this is the case as their gut says that there is something wrong in the markets and with our current credit system. A recent Citigroup study found out that many wealthy families are hoarding cash.1 Investors are stuck in a dilemma, taking on the risk to invest in markets which are at all-time highs and risking losses if markets crash. On the other hand, interest rates are historically low, while fixed income investments and deposit interest most often does not even cover the actual inflation rate. Hoarding cash in bank accounts, as many rich do according to Citigroup, can end fatally like it was the case in Cyprus where deposit holders were taxed to recapitalize local banks. In many European countries, deposit insurance does not exceed a nominal value of 100.000€ and every amount above is at threat if the bank fails or a deposit tax is introduced. It sounded ridiculous in 2011 when the Boston Consulting Group presented a study 2 of how governments would have to restructure debt. Now the International Monetary Fund (IMF) is supporting a wealth tax of 10%, which Forbes author Bill Frezza is like “quietly dropping a bomb” 3 . In its Fiscal Monitor Report, 4 the IMF is laying groundwork for the confiscation of global wealth to refinance excessive government debt. A tax of 10% is mentioned in the paper on page 49. This tax rate is most probably only a “test number” to see how investors react. In the end, the wealth confiscation could even take on much higher dimensions. What can investors do? There are plenty of possibilities to avoid becoming a victim of government arbitrariness. The foremost recommendation Shoreline can give is to diversify wealth across different regions. People that had all money stored in Cypriot banks were hit much harder than people having a diversification in various legislations like Switzerland or the UK. Not only is the distribution of money across different jurisdictions of importance, but also across different asset classes. Equities and fixed income investments from different regions and different sectors can give the highest potential security in the current environment. We think that holding cash in bank deposits is not rational in the current environment due to the risk of bank failure, deposits confiscation, and the loss of purchasing power due to negative real interest rates. 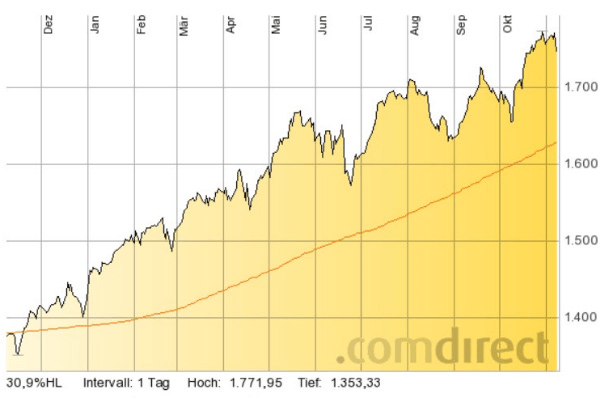 Short-term: bullish on developed markets equities, especially Europe, as long as it is silent around Eurocrisis. Central banks are doing everything to prop up markets and keep interest rates low. In the short term that might help. In the long run, we strongly doubt that this is a sustainable strategy. Major US equity markets are in bullish territory. New highs for the S&P 500 were hit in October with the index reaching 1771.95. Policies introduced by politicians and central banks are driving markets higher. 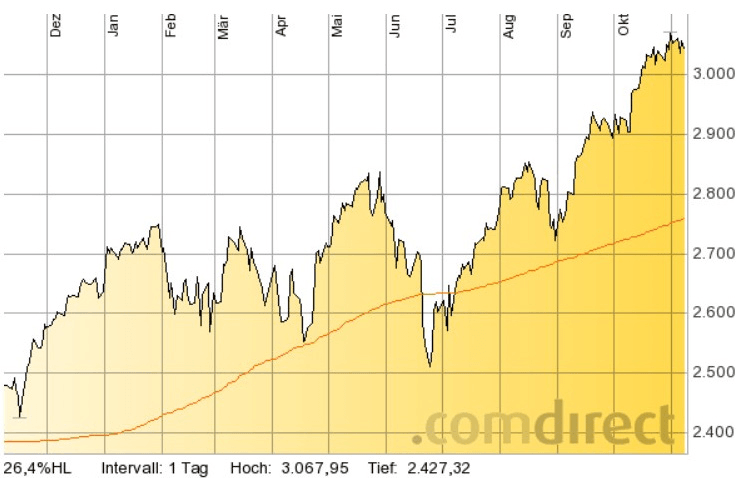 The S&P 500 is still far from the 200-day moving average (orange line). 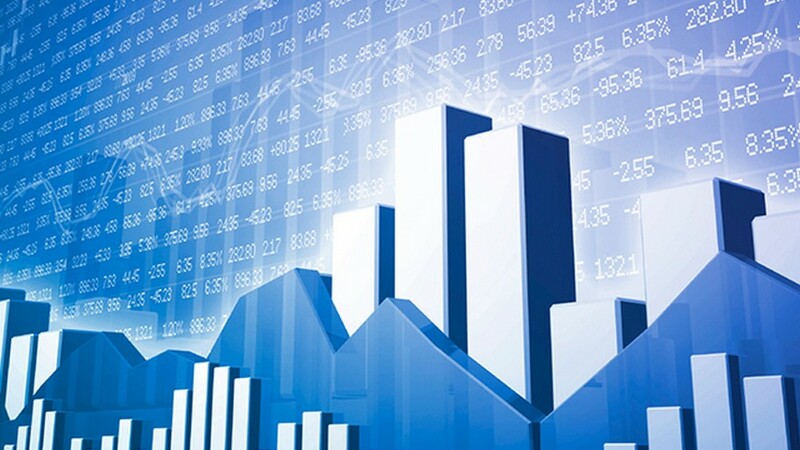 Markets show strength, recently dropping on 07.11.2013 after the European central bank introduced an unexpected rate cut to a new historical low of 0.25%. This should be taken as a warning sign that central bank policies are starting to have adverse effects on stock markets. However, under current circumstances we expect US equities to provide positive returns until the end of the year. Further dips could be good buying opportunities. 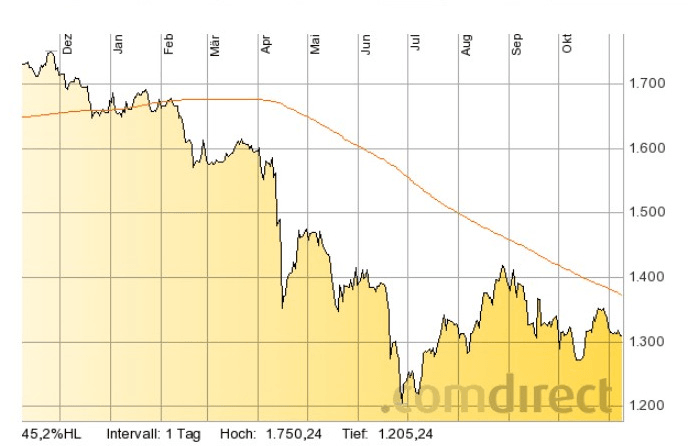 The Euro-crisis is not yet solved, but the EuroStoxx50 index shows strength and is in solid bullish territory. In the past two month, the index performed better than the S&P 500. It is close to recent highs and we expect the index to reach new highs soon, probably yielding superior returns over the S&P 500 until the end of the year. Our expectations hold as long as no new surprises come up in connection to the Eurocrisis. Dips in equity markets could be good buying opportunities. The gold price is still stuck slightly above US$1300 per ounce. Gold recently lost its position as a safe haven with prices well in bearish territory. An outbreak above the 200-day moving average (orange line) would change the setup and bring gold back to bullish territory with a likely rally up to US$1700 per ounce or even higher. On the other hand, a further drop is likely. Risk averse investors should wait until the gold chart comes back into bullish territory, underpinned by the rise of investors’ confidence in gold and gold mining stocks. Momentum of major equity markets looks positive showing surprising strength, but with discussed uncertainties. We see this as a strong sign that equity markets will continue to rise, backed by cheap money and lack of other investment opportunities. Major risks remain and investors should be aware of the fact that markets are volatile. Many developed markets are close to its highs and a correction will happen eventually. To determine this point in time, analyzing market conditions and active management of the portfolio is vital. This information used in this newsletter has been prepared from a wide variety of sources that Shoreline,to the best of its knowledge and belief, considers accurate. You should make your own enquiries about the investments and we strongly suggest you seek advice before acting upon any recommendation. The opinions expressed in this report are those held by the authors at the time of going to print. The views expressed herein are not to be taken as advice or recommendation to sell or buy shares. This material should not be relied on as including sufficient information to support an investment decision. Any forecasts or opinions expressed are Shoreline’s own at the date of this document and may be subject to change.